The Emperor’s New Groove was the second animated movie Disney released in 2000, and suffice it to say, it’s a very different film from Dinosaur. Initially, the studio was producing a film called Kingdom of the Sun, intended to be a serious version of The Prince and the Pauper set in Peru. It already had the plot elements of the selfish ruler and the scheming advisor, but the tone would have been more along the lines of The Lion King. Although half of the animation was completed and they had a full soundtrack by Sting ready, too many complications arose and the film was re-worked into a comedy. The ups and downs of the production were chronicled in a documentary called The Sweatbox, but it’s very difficult to find this film as Disney seems intent on keeping it off the internet. It was filmed by Trudie Styler, Sting’s wife, and focused a lot on the bureaucracy Sting and the filmmakers had to deal with from the studio just to make Kingdom of the Sun/The Emperor’s New Groove happen at all. The Emperor’s New Groove centers on David Spade’s Kuzco, emperor of a fictionalized version of Peru. He’s self-centered to the extent that he has a servant just to sing his background music. Kuzco summons one of his subjects, a llama herder named Pacha, to the palace just to tell him to relocate so Kuzco can build his summer home on his hill. Selfish as Kuzco may be, his advisor Yzma, who wants to take his place, is even worse. She goes behind his back, performing royal duties like listening to village complaints, only to tell them she doesn’t care. When Kuzco fires her, Yzma and her henchman Kronk try to poison Kuzco but only end up turning him into a llama. A series of mishaps lands him in Pacha’s cart, and the two are on a journey to get Kuzco home, keep him alive and hopefully convince him to reconsider his plans for Pacha’s home. The Emperor’s New Groove is absolutely hilarious. I’d say this is the funniest animated film Disney has produced. The animation is fast, the dialogue is wacky and nobody misses a beat. Usually in a Disney movie one character will tell most of the jokes, normally someone’s sidekick; in this movie, every character is funny except for Pacha. 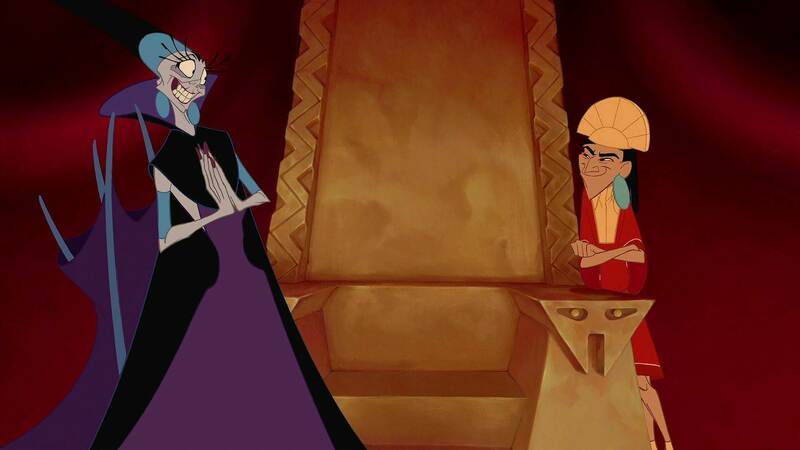 Some of the best comedic moments come from villains Yzma and Kronk. Yzma is played by Eartha Kitt as a corrupt, unhinged advisor who “practically raised” Kuzco. She’s right to be outraged by his treatment of her, but her reaction is so crazy you just have to laugh. Her over-complicated plans undo themselves and, as she herself observes, her dependence on Kronk creates a lot of trouble for her. Kronk is a Herculean figure voiced by Patrick Warburton. 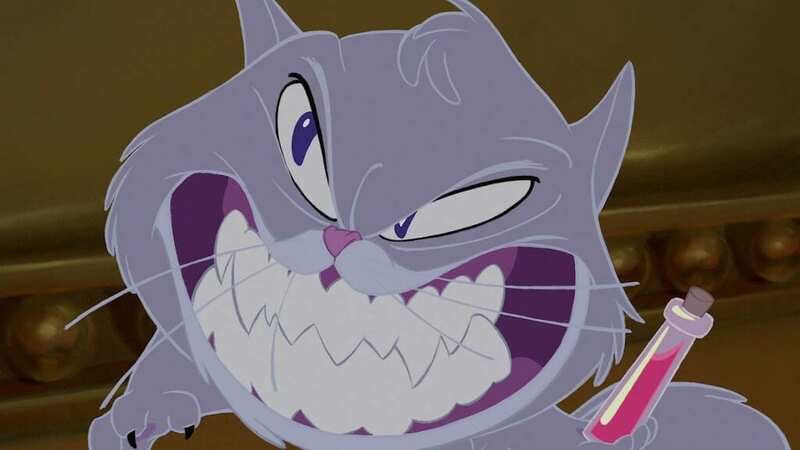 He’s more interested in baking than killing anyone, and frequently has mixed feelings about what Yzma is asking him to do. 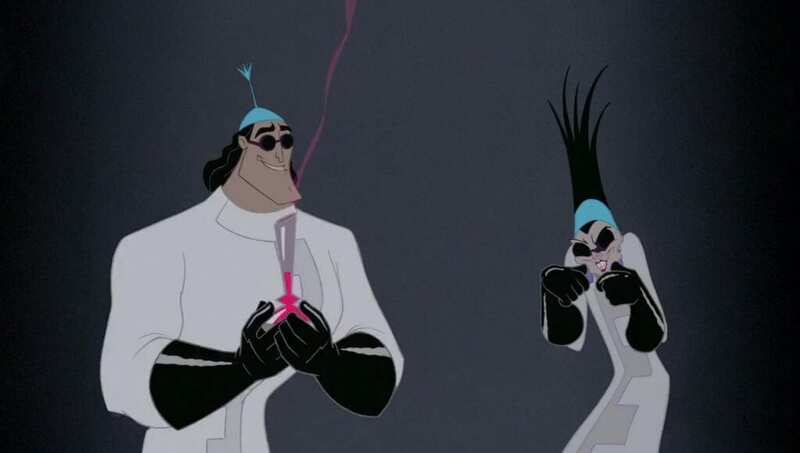 Although the film could give the impression that Kronk is stupid, it’s more that he’s just strange and lives in his own world, which could be said of several of the film’s characters. Kuzco is really funny too. He starts out as pretty much the biggest jerk ever, and it’s like they introduce Yzma just at the right moment to be the “real” jerk. Even when Kuzco is being unreasonable and selfish, you can’t help but like him. The heart of the film is his growing friendship with John Goodman’s Pacha, a simple family man who wants to herd llamas and doesn’t bother anyone. Although Kuzco is the film’s protagonist, it’s easiest to sympathize with Pacha. He’s a generally nice person who treats people and animals with respect and he doesn’t want to move his family from their ancestral home. His wife and kids however, are really funny. There’s a scene later in the film where Yzma and Kronk show up to terrorize Pacha’s family and the opposite ends up happening. Pacha’s wife Chicha is voiced by character actress Wendie Malick, who may be recognized for roles in films like The American President and Confessions of a Shopaholic, the latter of which also features John Goodman. I think The Emperor’s New Groove is overlooked because it’s a comedy with no beautiful princesses. Rather than the usual soft beauty of Disney animation, this film is fast-paced with a lot of slapstick, and in a way reminds me more of something Warner Bros. would do. The bright colors absolutely pop off the screen. It’s also one of the shorter Disney animated movies, running only one hour and eighteen minutes. Sometimes I wonder what it would have been like if they had proceeded with Kingdom of the Sun, but the film is a lot of fun as is. All of Sting’s songs were thrown out except for one, “My Funny Friend and Me.” This song plays over the credits and you can tell the film was originally supposed to be more dramatic. This song is beautiful and concerns friendship and what Kuzco has learned from his experience. There’s even a choir in the background of the chorus. It’s gorgeous, and it was probably a good idea to play it over the credits, as there’s no moment in the film serious enough to support such an emotional song. The musical score by John Debney is unobtrusive but lovely nonetheless, and he works Sting’s tune into the background a couple of times. All things considered, I really like The Emperor’s New Groove. It’s easily one of the best animated comedies I’ve seen, and one of my favorite comedies in general. This film fires jokes nonstop and everyone is on board for some laughs. The animation and dialogue are extremely brisk, making a very short movie feel even shorter.